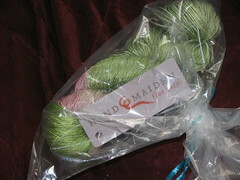 First I got yarn. The note promised there was more to come, but it was such lovely yarn. Handmaiden Seasilk in Lily Pond. Then, yesterday the mail carrier brought a box. It was small but heavy. And it smelled yummy. 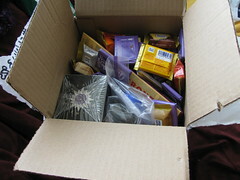 I opened it up and discovered there were scented soaps, a scented spray, tea (chai tea, even, it's so cool), and chocolate. All the rest was chocolate. 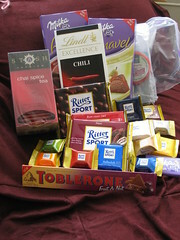 Yummy, yummy chocolate. This here, is a representative sampling. But there's more. Lucky me.